Cornyn, the most powerful Texan in Congress, attached the measure to a $1.3 trillion omnibus spending bill. WASHINGTON - There are 2,232 pages in the new federal spending bill signed by President Donald Trump on Friday, and it touches on nearly every aspect of American life: military funding, a border wall and even labor issues within minor league baseball. But for the most powerful Texan in Congress, Republican U.S. Sen. John Cornyn, it's language deep in the bill that has occupied much of his energy since early November. On page 1,982, there is a provision aimed at improving the national background check system in order to prevent felons and domestic abusers from purchasing firearms. Cornyn has been pushing for that measure since two days after the mass shooting at a church in Sutherland Springs, when he went to the Senate floor to proclaim the need for the "Fix NICS Act." NICS, the acronym for the National Instant Criminal Background Check System, is where many believe part of the system failed in the Sutherland Springs incident. The shooter was an Air Force veteran with a record of domestic abuse convictions, meaning he should not have been allowed to purchase firearms. The Air Force failed to put this information into the national background check apparatus, however. He was able to purchase a rifle and later killed 26 people in the shooting. “We need to better understand why our existing laws didn't work in this instance, and that's what my proposed legislation will do," Cornyn said on the Senate floor when he announced his push. Many advocates for gun restrictions argue the measure was simply not enough. But Cornyn partnered with one of the Senate's most prominent advocates for new gun legislation, Democratic U.S. Sen. Chris Murphy of Connecticut, who was the representative of Newtown, Connecticut, in December 2012 when a gunman entered Sandy Hook Elementary and killed 26 students and teachers. Ten days after Cornyn announced his plans, two U.S. representatives from Texas, Henry Cuellar, D-Laredo, and John Culberson, a Houston Republican who is member of the powerful House Appropriations Committee, moved on a House companion Fix NICS bill. But that attempt was tied to another gun measure that would not pass in the U.S. Senate, and the issue went dormant until the Feb. 14 high school shooting in Parkland, Florida. After the Florida massacre, Cornyn drummed up support to pressure the entire Senate to attach Fix NICS to the must-pass spending bill. Nearly all of the measures listed in Fix NICS are intended to reward agencies and states that are able to effectively relay records into the national background check system. The new law will require federal agencies to come up with plans to upload this information into the system; will publicly report and prohibit bonus pay for political appointees at agencies where this mission falls short; will reward states with grants when they comply; and will reauthorize already existing programs in states that share this information. Fix NICS will also provide technical assistance to comply with these new requirements, and it will create a new program called Domestic Abuse and Violence Prevention Initiative that will make sure states have adequate resources to keep felons and domestic abusers from purchasing firearms under current law. In the end, Cornyn pulled in 77 other senators to serve as cosponsors for the bill and signed them on in a steady fashion that kept the bill in the news. It helped that Cornyn is the Senate majority whip, giving him extra leverage to move his own bills. That allowed him to tack the plan on to the spending bill when other lawmakers failed to add their pet issues. Cuellar, whose district includes Sutherland Springs, also celebrated the win. “The Sutherland Springs shooting revealed dangerous loopholes in the NICS database, and this bill is a necessary step forward in closing those gaps," he said. And Culberson, who is in a tough re-election fight in a west Houston district where his potential Democratic rivals are both campaigning heavily against him on the gun issue, credited Cornyn for much of the work. 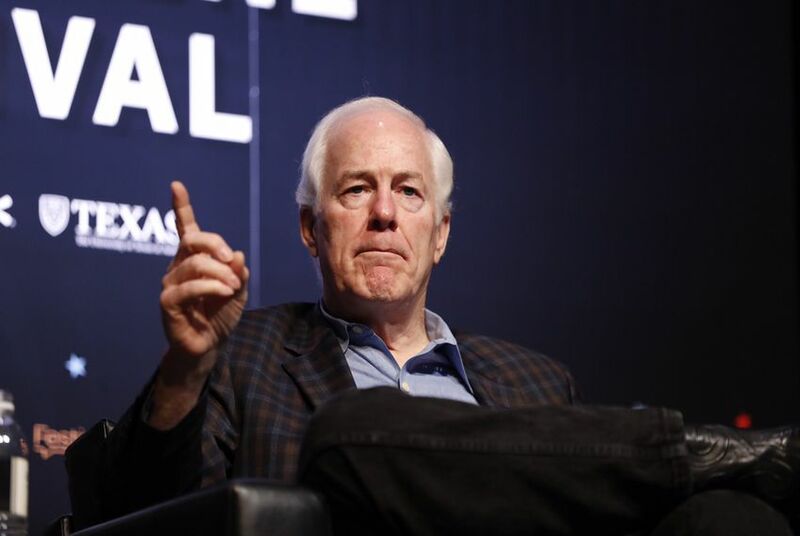 “I thank Senator John Cornyn ... for crafting the original Senate version of this bill and for leading Congress towards finding solutions to this crucial issue," he said.